Next up is All Occasion Tags by Tami Mayberry! This one is perfectly titled as it is perfect for so many occasions! Plus, it coordinates with Spellbinders Grommet Tags! I just love this polka dotted tag! It is so cute and adds a fun factor to the card. very nice tag sample, love the print and colors! That is such a fun card with all its dots. Would brighten anyone's day. Love this card. Simple, but packs a wallop with the help of a fabulous background paper. Great job. I love this card! Fabulous print, gorgeous colors, and the perfect embellies! Beautiful job, Janice!! I am really falling in love with that blue raspberry!! Ooh this paper is wonerful. Thanks for the inspiration. Wow... you just convinced me that I "need" Blue Raspberry! : ) Love that card, Janice. Great card ...love the fun colors in the paper. Beautiful! And I'm absolutely loving the new labels. Beautiful Janice! Love how you've embellished the tag! What a cute card I love it!! Gorgeous Janice! Love that tag with the pop of the blue! Love your sweet, cheerful card!! I really like your background paper and the polka dot is so cute with it. Wonderful job!! Very pretty card--I like the dots too. Very pretty thank you card. Love the colors on it. Cute card - I really love the tags too! pretty - love the embellishment! Glad to hear that little glitches even happen to the pros! Love your card -- the paper and the sentiment and overall layout are fabulous. Great colours and creativity flowing here! Fabulous cards as always. I enjoy seeing the stuff you come up with! Can't wait to see what you come up with next! Great card!! Love the new stamps!! I'll check back, Janice - for sure! The card you posted is fabulous. I love the one you did do...just gorgeous. Love the polka dot tag too! Nice layout! love the BG paper. It's so cute with those berries. Such a sweet card Janice!! LOVE that dp and great embellishments for the tag!! No need to stress! I love the card you posted. I'm thinking I gotta have that Blue Raspberry! Beautiful! Stunning card Janice - bright cheerful and uncomplicated - it showed the tag stamp off to full advantage. Very cute card. Like the colors. Very pretty cards! Love the blue of the second one. Thanks for sharing. Love the way you did the combo of the tag with the vine....very nice! Janice, I love the tag set card you made. Awesome. Nice use of printed paper and embellishments. Great job! Hey! You pulled a fast, and beautiful one., by combining both sets. Great job. Very cute cards! I really love that flower & circle paper in the second card. Great card.. love the colors! Both cards are very pretty. Love the ribbon combined with the vines. Amazing. Very pretty with the 3 strands of ribbon on the 1st card. Very cute cards! I love how fun the tags are too! Very pretty cards. Thanks for the inspiration! 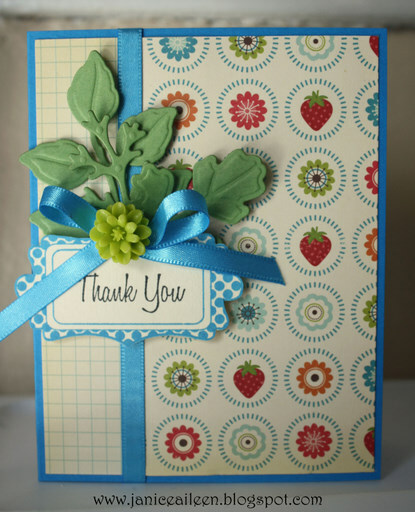 Your vine card is soooo different and elegant...love the polka dots and strawberries, too! Both cards are very sweet - love the ribbon on the first one!!! My fav is the tag card! Absolutely love your card with the vine! Your tag card is so cute! The triple ribbon of your first card really caught my eye! I really enjoy this card. It's a fun card and a great card. Oh beautiful design with the tri-ribbon treatment!! Don't worry..be happy...you do fabulous design work!! Gorgeous~Gorgeous!!!! Love all your details and colors!! Hi Janice! Gorgeous cards!! Take care! Very pretty cards - loved the thank you card! So simple, yet really pretty! Very,very pretty Janice! I really like these. 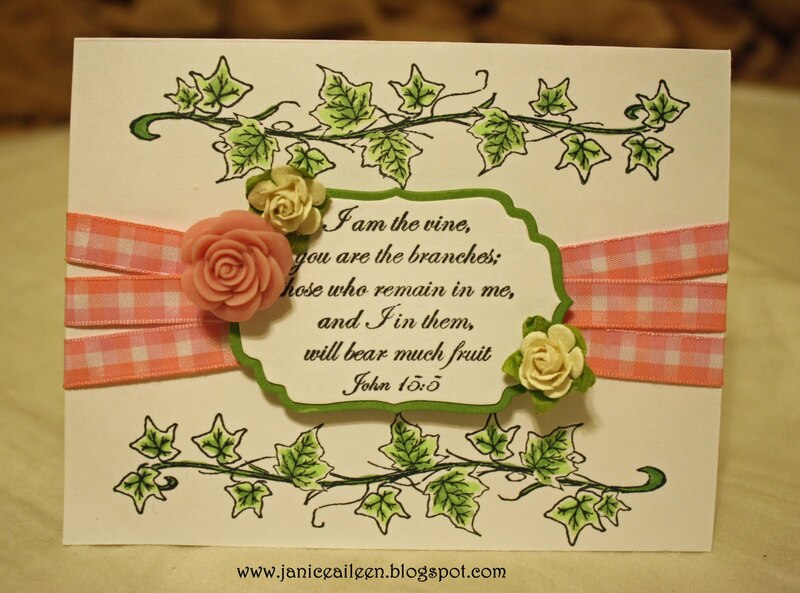 Janice love the beauty of your vine card and the brightness of the other. Nice contrasts! As always, your card is STUNNING! So smart using ribbon as the 'paper'. Oooh. More tag stamps! Yay! And the projects you did look fantastic! Great work! Your cards truly are inspiring! WOW! Your vine card is fantastic!! The ribbon work on the first and the vine under and above is such a beautiful design. The second is just beautiful in every way!! !